As soon as Darren Carter takes the stage he unleashes a captivating flurry of impersonations, observations, and off-the-wall social commentary that is a comedy experience unlike any other. Darren''s contagious charm and vivid imagery paints a picture that is both relatable and one of a kind--no wonder critics nationwide are calling his act ''one of a kind'' and ''a must see''.With acerbic wit, brilliant delivery, and an animated style of his own Darren Carter captivates a crowd and leaves his audiences rolling in laughter and begging for more. The Los Angeles based comedian has performed all over the world and is a fan favorite at the nation''s most prestigious clubs including the Laugh Factory, Hollywood Improv, Comedy and Magic Club and The Ice House.His unique blend of comedy, sketch, and impersonations have garnered industry attention in comedy, acting, and music. After being spotted by hip-hop superstar Snoop Dogg for his dead-on impersonations of the rapper, he has performed multiple times at Snoop''s annual family reunion.The party doesn''t stop there. After appearing in the summer blockbuster ''Be Cool'' with John Travolta as well as a string of TV appearances including Comedy Central''s ''Premium Blend'', BET''s ''Comic View'', ''The Tonight Show'' with Jay Leno, and a regular guest on ''Comics Unleashed'' Darren is quickly becoming a household name.So what''s next for Darren? 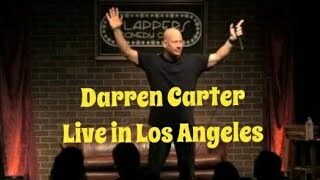 After rocking the stage for over 20,000 fans at the nation''s largest comedy concert--LA''s prestigious Power 106 Comedy Jam--Darren was immediately dubbed a fan favorite and has been asked to return once again and bring the funny alongside the biggest names in comedy including Carlos Mencia, Lisa Lampanelli, Russell Peters, Katt Williams at this year''s Comedy Jam 2008.Darren can be seen on "Chelsea Lately" on E! and "Comics Without Borders" on Showtime. Since being featured on Myspace Comedy as a ''comic to watch'', DC has expanded his entertainment repertoire lending his voice over talents for five characters in the top selling Activision video game ''Tony Hawk''s American Wasteland''.In 2008, we have also seen the release of his critically acclaimed comedy album ''Shady Side'' now available on Itunes. Waiting to catch him on TV? Tune in this September for ''The Comedy Slam'' on Showtime. Or check him out on National Lampoon''s College Network where he is a regular on camera host.